Secretary of Defense Caspar Weinberger served in the Reagan Administration from 1981 through 1987. In 1986, the Department of Defense became entangled in the Iran-Contra Affairs when it sold missiles to the Central Intelligence Agency to be sent to Iran. Weinberger denied substantial knowledge of the arms sales to Iran, but his own diaries (which he later attempted to conceal) show otherwise. As early as June 1985, National Security Adviser Robert McFarlane suggested in a memorandum (which Weinberger read) that the U.S. sell arms to Iran. In August, according to General Colin Powell, who was present at their meeting, McFarlane told Weinberger about Israel's willingness to sell those arms and discussed the negotiations that had led them to that point. Before mid-September, Weinberger received intelligence reports regarding the arms-for-hostages deals from one of his colleagues; after mid-September, at his request, they were sent to him directly. From his diary, it is clear that in October, he knew the details of the arms transfers, as well as the role played by National Security Council staff member Oliver North. In November 1985, McFarlane updated Weinberger about the sales again and asked that he arrange the sale of 500 HAWK missiles to Israel, essentially to replenish their stocks. Weinberger concluded that doing so without notifying Congress would be illegal and told Reagan so in December. Ultimately, Reagan decided that the sales with Iran should be completed directly through the CIA. Although Weinberger questioned the legality of this action, even predicting that someone would end up in jail as a result, Reagan signed a Finding authorizing CIA involvement. Despite his objections, Weinberger's diary shows that he was kept well informed of the sales, receiving a new update almost every month. For example, in February 1986, he was told about the expected timeline for arms shipments and the release of hostages. In April, he found out that more missiles were to be shipped. In July, he was told that Lebanese hostage Lawrence Jenco was released as a result of pressure placed on Lebanon by Iran, which Iran's leaders had done so that the U.S. would sell them more missiles. Moreover, Weinberger ultimately aided these sales by selling weapons to the CIA, which were then shipped to Iran, three times: in February 1986 (TOW missiles), in May 1986 (HAWK missile parts), and in October 1986 (additional TOW missiles that were sent to Israel). Weinberger's senior military assistant updated him about each transfer. Much of this information was discovered from Weinberger's diary, uncovered before he was even a subject of investigation in 1991. 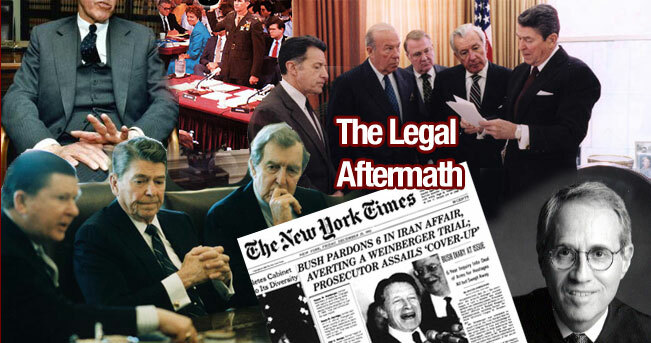 Despite his claim to the Independent Counsel's staff and to Federal Bureau of Investigation agents that he did not often take notes and that he never did so when he met with Reagan and other Cabinet members or at meetings about arms sales to Iran, Walsh's team came across thousands of pages of notes that Weinberger had written since 1981. This was a serendipitous occurrence for Walsh. When his team went through the Library of Congress in November of 1991, the group looked at the entire index and found these notes, which had accidentally been placed in the unclassified section despite their inclusion of highly sensitive information. False statements to the Office of Independent Counsel and the FBI regarding his note-taking. Regarding the second count, Weinberger had told staff of the congressional committees dealing with Iran-Contra, “I don't have any memory of any contra funding or of anything connected with [the Saudis] that I can remember now.” But just a few years earlier, in one of his notes, he recorded Saudi Arabia's $25 million contribution to the rebels. Also contradicting his contemporaneous notes and diary entries, Weinberger, when asked by the staff of those committees whether he knew that the shipment of HAWK missiles to Iran on November 23, 1985, was going to take place, said that he did not. Although Walsh presented this case against Weinberger in his final report to Congress, he was never able to prosecute his claims. President George H.W. Bush preemptively issued his controversial pardon of Weinberger in late 1992.